Archaeological work in Hrubieszów-Podgórze excited archaeologists and yielded essential information about the Goths. Among the most important discoveries were relics of a long house, marked number 45 on the plan of the excavations. It stood out against other houses not only due to its dimensions but also because of its clear elements of structure. The building was approx. 21 m long and 11 m wide, its longer side being situated on a west-east axis. It was divided in two parts. The western side, measuring 11 m by 11 m, had a section which has now sunk 70 cm into the ground. Remains of a clay furnace were found by the western section. Fragments of walls forming the dome of the furnace survive to this day. Judging by the filling of the hollow it can be assumed that its bottom was originally covered with wood forming the floor. Near the centre, under the floor, archaeologists came across animal remains – probably a foundation sacrifice for this building. The basic structure of the wall was formed by 18 posts in the form of a tetrahedron (their cross-sections measuring 50 cm by 60 cm) dug into the undisturbed clay soil at a depth of 60 cm, that is 90 cm below the present-day surface of the ground. One-metre long fragments of the posts can be seen today. The posts stood almost two metres apart, and their sharp ends suggest that they were rammed rather than sunk into the ground. Most likely the space between them was filled with walls made of laths placed horizontally (vertical-post log construction?). The lack of posts by the south-west corner of the building indicates that the entrance was in this place. The eastern part of the building was a light, overground structure, probably supported by ten solid posts. Numerous pieces of pugging with impressions of thin bars and charred fragments of beams indicate a wattle-and-daub structure, and the walls were later sealed with clay. By the south-west corner of the building are traces of a partition wall, which may suggest that a pen for cattle or other small livestock was included in the building. The arrangement of the posts inside the building indicates that the building was covered with an asymmetric roof with a steep slope on the northern side. The profile of one of the pits in the eastern, storage area of the house suggests that there was a small attic, or even another level, accessible via a ladder (steps cut into a tree trunk). Such huts are very rare. We have come across no more than fifty constructions of this type in the area of Barbaricum. 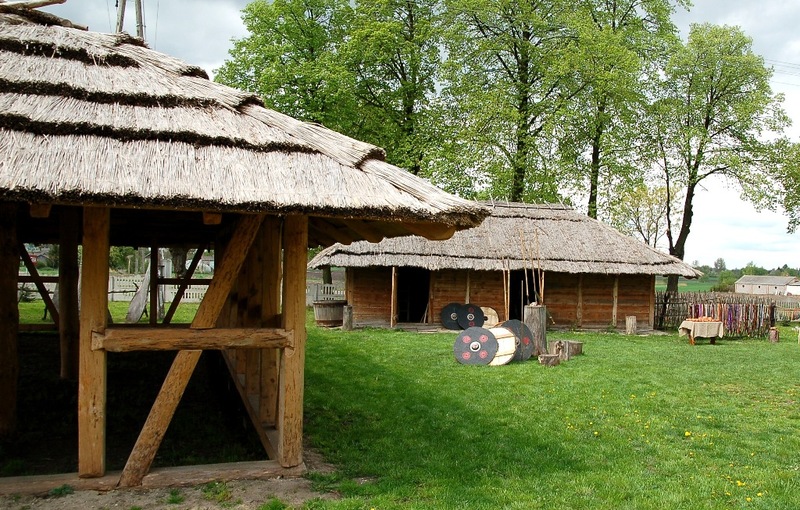 We do not know why the biggest concentration of these buildings is on the western area of the Chernyakhov culture and the eastern part of the area inhabited by the Sântana de Mureş culture. It was established that in contrast with the territories occupied by other cultures, where large buildings served as outbuildings or houses of assembly for the settlement, Gothic structures served as living and utility buildings. Assuming that the buildings were common in the Masłomęcz group, one can expect that there may have been as many as two hundred houses of this type in Masłomęcz. Copyright © 2019 Masłomęckie Stowarzyszenie - Wioska Gotów. All Rights Reserved.